A low down on plastic pollution and some creative ways to keep those bags in check. Plastic bags, the scourge of our planet. On the one hand, plastic bags are innocuous carriers of stuff. We use them to bring home groceries. A restaurateur ties them carefully around our take-out soup to prevent spills. They keep the wet swimsuit from soaking our clothes in an overnight bag. Yet they also serve as the modern marker of impending doom. In movies or photographs, every bad neighborhood, every empty stretch of road where evil is surely soon to invade, is populated by a plastic bag impaled on a barbed-wire fence or blowing listlessly across the street. That doom, of course, also applies to our planet. Only about 12 percent of plastic bags and film were reused or recycled in 2007, according to the U.S. Environmental Protection Agency (EPA). The rest were discarded. Plastic bags are lodged in our waterways, creating irreversible harm to animals on a physical level — bags in stomachs or around necks — and on a molecular level as the bags disintegrate, the chemicals they release into the environment can create hormonal changes in living things. While China has banned plastic bags — reportedly saving 1.6 million tons of petroleum for bag production in just one year — most of the rest of us are offered plastic bags daily. 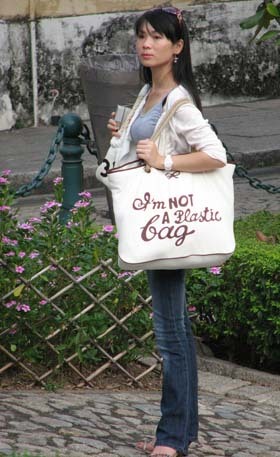 Reduce your plastic-bag impact on the world by taking personal action. First, just don’t take a bag – Bring your own with you. If you travel by car, keep a stash of reusable bags in the car. Carry a knapsack or messenger bag where you can stash purchases. Invest in a few expandable string or nylon bags. Bring along reusable mesh produce bags for fruits and veggies, and reusable muslin bags for bulk buys. What if the deed is done? Put your stash of bags to good use by reusing them. Here are seven ideas to get you started. 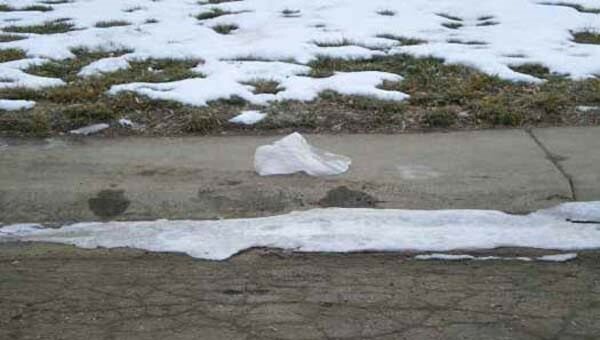 Many people reuse plastic bags as small trash can liners. But don’t use this as a reason to get bags, necessarily — we avoid accepting plastic bags and leave our trash cans unlined, putting all our trash into one larger, recycled plastic bag that we dump each week. It doesn’t smell, because we compost our degradable waste. If you have a stack of bags, an iron and some parchment or other non-waxed paper, you can fuse layers of plastic bags together to make waterproof linings for other bags, floor cushions, and more. Be sure to open a window and maybe even wear a respiratory mask to keep the fumes out of your body. Watch a tutorial, and visit Craft for ideas of what to do with the fabric — like making a raincoat! You can crumple up plastic bags to put in the bottom of a flowerpot, before filling with potting soil. The pot will be lighter, have easier drainage and require less dirt. Best for non-edible annual plants. Throw one or two in your bag or luggage to keep dirty shoes off your packed clothes, or keep your notebook dry even with a damp umbrella in the same bag. If you’re a knitter or crocheter, consider slicing and dicing bags into plastic yarn, or “plarn.” See a tutorial here from Helle Jorgensen, who crochets phenomenal plastic sea creatures from old bags. 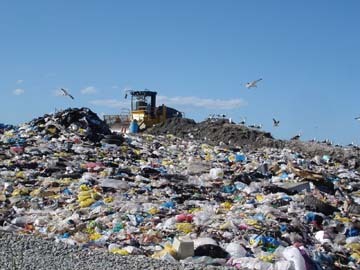 While the EPA reports that only about 6.8 percent of all plastics were recycled in 2008, many communities now have drop-off sites that accept plastic bags for recycling. And “filmy” plastic includes more than just grocery sacks. In the same bin, you can return dry cleaning bags, shrink-wrap from boxes, clean plastic wrap, newspaper bags or any lightweight plastic to be turned into another product, like lumber, garbage bags or milk jugs. If you must buy plastic bags — to carry away major garbage, for instance — buy recycled. Several countries have banned (or taxed) plastic bags in an effort to reduce plastic bag usage. To learn more check out our page on green living.